Local / internal search support! Local searches (searches performed with your site's own search engine) has been one of the biggest feature requests we've had over the years, so we're happy to finally support it! And that about covers everything! Is there support for multiple local search parameters? I have a CMS that uses one query string, and a blog that uses another. Both use the same tracking code. Brian: We will be releasing an update containing this feature (multiple local search parameters) in the near future. Bill: Based upon the URL you entered, your "local search parameter" field should contain the value "s", and nothing more. Should I insert only "q" or "/search?q"? I'm trying to get this to work, but the search parameter doesn't seem to be in the URL when using google custom search? 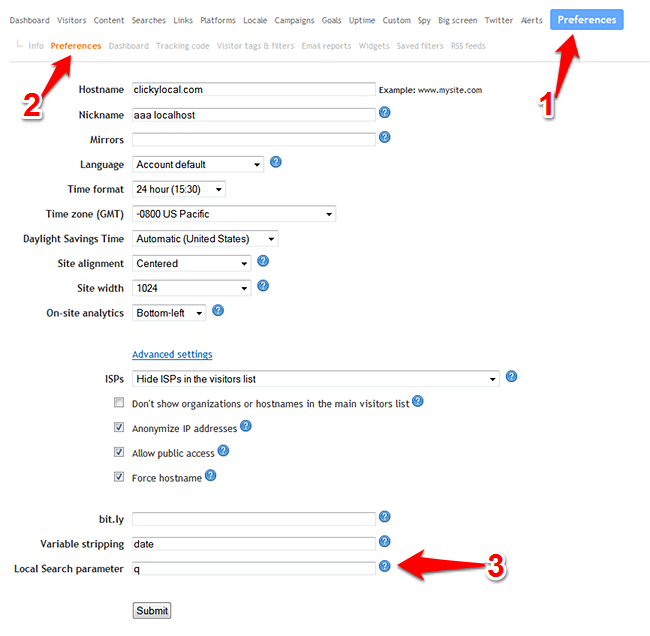 Rute: For your URL, you'd enter "q" into the 'local search parameter' box. I added a few examples in the blog post, at the top. can i just use /search/? Nice feature, but what about searches submitted by post?? This is going to constitute most of the searches on most sites. As mentioned earlier, I'm using google CSE. 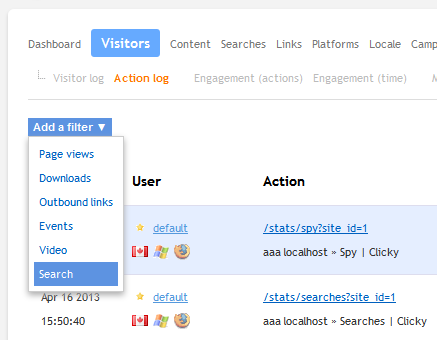 Local searches show up in Spy, but they don't show on the Searches -> Local Searches menu. Is there any known issues with that section? Really like this. Thank you! What about if I am using Google CSE to provide search functionality can you track that too? It's a great feature but it doesn't work on my wordpress blog. The query is "?s=test" so i've added "s" to my "Local Search parameter". What do i've to try? I'm at least the 3rd person who is trying this who is using wordpress and has ?s= in their searches, so according to the post we should be using "s" (without quotes) in the parameter field. But its not working for us 3 people. So I hope clicky developers are reading these comments and can help us out. I really hope this works for wordpress.org types like us. It will work for wordpress. Once you enter in the parameter, caches have to clear before we will start processing it. Give it at least a few hours. I tried to disable all the caching plugins and i cleared the local cache of my computer. Then i made some tests, several times today (with different browsers and platforms). I will wait 24 hours and i'll let you know! Sorry, I meant caches on our end. If you are testing yourself, that won't work since we ignore your own traffic by default. You need to enter incognito or private browsing mode so cookies are turned off. Thanks for the response. I'll wait and check it tomorrow! Will there be a api call to add search info to the current visitor/user/tracker ? The last dropdown, the user clicks is a normal href, so adding a click event there isn't the problem, even search data ( search string ) can be added there. I tried src but the only thing that showed in local searches was the word search. I tried search_this but still nothing. 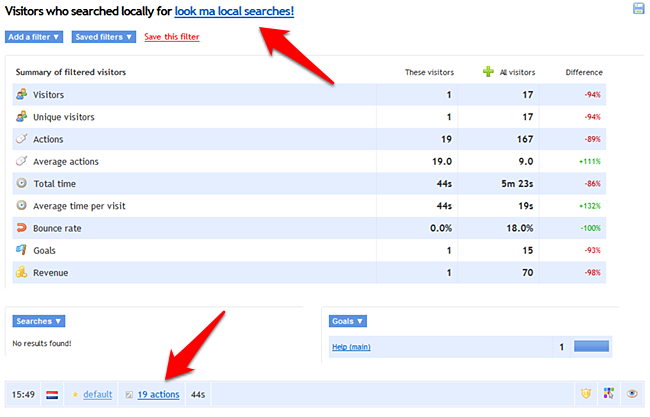 I tried 'search' as parameter, but it's not logging anything under Local Searches since this was announced. can i just use /search/?" Not yet. But we will support that.